SDS convention in solidarity with Quad City Die Casting workers | Fight Back! The students and youth of SDS stand in solidarity with the union workers of UE Local 1174 in their fight to keep Quad City Die Casting open. We condemn the Wells Fargo bank for refusing to finance the factory in Moline, Illinois. This outrage comes after Wells Fargo received $25 billion dollars of taxpayer’s money in a bailout earlier this year. Wells Fargo is sitting on the money. So now a locally owned factory employing over a hundred workers is being forced to shut their doors. However, the union workers are fighting to save their jobs! 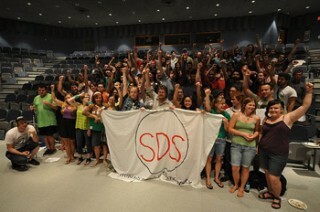 SDS is joining with the demand of the UE workers that Wells Fargo finance the company so they keep their jobs. Like the Republic Window and Door workers in Chicago this past December, it is unacceptable that a huge bank receives billions in bailout funds yet hangs the workers out to dry. Wells Fargo received $25 billion dollars from the recent bailout.